On this weeks white flag lap, Craig Lowdnes talks about his first Book “The Inside Line”. Tony Schebeci (SEN) and Luke West (V8X/Auto Action) look back at all the action from the Symmons Plains round of the championship and preview Sandown. On this weeks white flag lap, Jason Bargwanna talks about his first season with Kelly Racing. 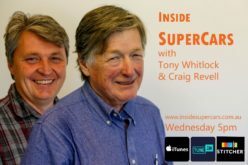 This week, Peter Norton (Inside Motor Sport) and Grant Rowley (speedcafe) look at V8 Supercars becoming an international recognized series. The sponsorship changes for 2011, and preview the Tasmanian Challenge. On this weeks white flag lap, Mark Larkham talks about preserving the history of the series and the car of the future. Tony Whitlock (Racefax) and Lachlan Mansell (Motor Sport News) Look at the 2011 Calendar and look at Brad Jones Racing’s sponsorship drama’s along with Warren Luff’s return to a full time ride. We also hear from Steven Chopping (CAMS Chief Steward) about the Gold Coast penalties.